How to take sustainable farming practices to scale? The Livelihoods-Araku #2 project in India aims at transitioning 18,000 ha to sustainable farming practices. Composting will be one of the key practices that the farmers in the project will implement to restore soils with high-quality nutrients to improve its fertility and ability to retain water and sequester CO2. To meet the ambitions of the Livelihoods-Araku #2 project, 900 tons of compost will be needed each year for the Sustainable Agriculture and Land Management (SALM) practices. The manure prepared by each farmer is insufficient to meet such a target. Moreover, the on-farm composting process is very labor-intensive and would add to the workload of the farmers. To make high-quality natural compost available for the 40,000 women and men farmers, the Naandi Foundation has designed large-scale compositing units with a very simple process and technology. Biomass, from crop residues from farms and the abundant vegetation in the valley, is collected and brought to the composting unit. Microbial inoculants, micro-nutrients and dung are added to the biomass to get a compost much more superior in quality than the on-farm manure. Afterwards, a simple tractor attached with a turner machine regularly turns over the heaps of biomass to induce aerobic activity. The heaps are regularly watered to maintain adequate moisture. The repeated and sequential turning of biomass and watering ensures faster decomposition and hence quicker conversion to high quality compost as compared to manual composting. In addition to providing farmers with large quantities of high-quality composts, these units bring many advantages to the communities. 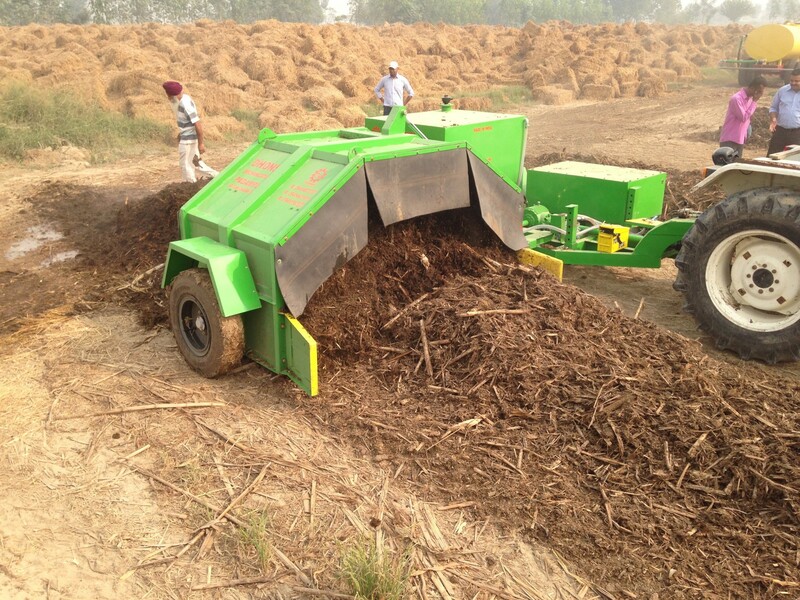 The units are cost-efficient as many villages can mutualize one composting unit and share the machinery and labor which can be moved from one unit to the other. As there is an abundance of biomass in the valley, the raw material needed is easily available and at a very low collection cost as the units will be very close to the villages. With the compositing units, all farmers will have access to the same high-quality compost, making the replication of the SALM practices at large-scale easier. The compositing units will be implemented in partnership with “The Small and Marginal Tribal Farmers Tribal Aided Cooperative” (SAMTFMACS) which already manages the production and sale of Araku Coffee in the valley. The production, packaging and transport of the packaged compost will create local jobs at the SAMTFMACS for youths. Moreover, bio-centers to produce “Cow Pat Pit”, an organic fertilizer, as well as fruit-tree and forestry nurseries will be developed. Nearly 9 million saplings will be needed to meet the Livelihoods-Araku #2 targets. The project will support young local entrepreneurs to engage in these activities to provide them with long-term revenues.